The municipality of Guardo (7,027 inhabitants in 2012; 6,283 ha; unofficial website) is located in the northwest of Palencia Province, 100 km from Palencia. The municipality is made of the town of Guardo and of the villages of Muñeca (106 inh. ), Intorcisa (62 inh.) and San Pedro de Cansoles (11 inh.). Guardo was mentioned for the first time in 940, when Diego Muñoz, 1st Count of Saldaña, transferred to the San Román de Entrepeñas monastery of Santibáñez de la Peña "the San Quirce church in Boardo, together with houses, orchards, pastures, gardens, and all the surroundings". The etymology of Guardo is a matter of speculation. Quirino Fernández believes that the name of the town comes a Roman Latin toponym, Bucca ad arduum (via Buccarduum, Bucardum, Bucardo, Boardao, Buardu, and Guardo). Julio Caro Baroja advocated for a Celtic toponym, Ward, meaning "a stormy place". Located on the border between Castile and León, Guardo was protected by a castle and walls. King Alfonso VII ordered in the 13th century to "maintain the castle of Guardo and the troops that have always been stationed here". On 3 December 1354, King Peter I the Cruel transferred Guardo to Juan Rodríguez de Cisneros; the domain of Guardo also included the villages of Velilla, Otero, Mantinos and Villalba. In 1475, the lord of Guardo, Diego Hurtado de Mendoza, was made Duke of the Infantado by the Catholic Monarchs. His descendants would rule the town until the end of the feudal system in the 19th century, the last lord being Pedro de Alcántara y Toledo. Coal-mining started in Guardo in the early 20th century, causing the demographic and economical boom of the town. In the 1950s, chemical industries and power plants even increased the wealth of the town. Guardo was then the 2nd biggest town in the province after Palencia; in 1974, the per capita income was even greater in Guardo than in Palencia. This Gilded Age ended with the closure of the mines and the crisis experienced by chemical industry. Muñeca is the birth place of the composer Claudio Prieto (b. 1934). Originally a member of the Guardo musical band, Prieto subsequently studied with famous modern composers, such as Bruno Maderna, György Ligeti and Karlheinz Stockhausen. His piece Solo y Solo for a flute and a guitar was awarded in 1969 the title of "Best Spanish Work". On 30 December 2001, his Himno a Guardo was performed for the first time in the St. Barbara church of Guardo (video). 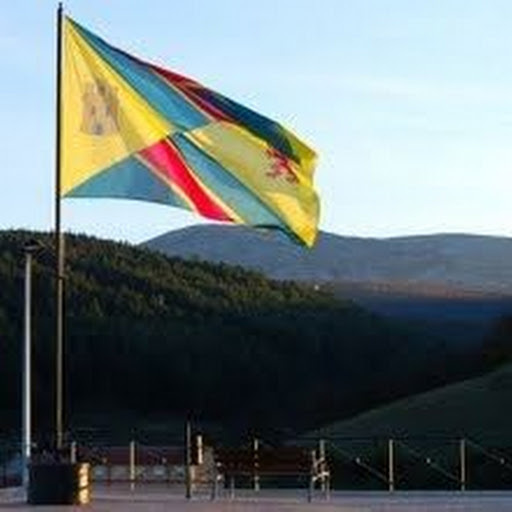 The flag of Guardo is prescribed by a Decree adopted on 30 May 2005 by the Municipal Council, signed on 1 June 2005 by the Mayor, and published on 10 June 2005 in the official gazette of the Palencia Province, No. 69, p. 18 (text). The flag is not described in the Decree. The flag (municipal portal; photo, photo, photo) is rectangular, quartered per saltire. The first and third fields are yellow, charged with a Castilian castle and a Leonese lion, respectively. The second and fourth quarters are made of three diagonal stripes, green, red and green, separated from each other by a yellow fimbriation. The memoir supporting the proposed flag was written, for free, by Guardo-born Ángel Prado Moura, from the University of Valladolid. The castle and the lion recall the location of Guardo on the border between Castile and León. The coloured fields are taken from the arms of the Mendoza, Dukes of the Infantado. Diego Hurtado de Mendoza y Figueroa (1415/1417-1479), the elder son of Íñigo López de Mendoza, First Marquis of Santillana, was made Duke of the Infantado (full title, "Duque de las Cinco Villas del Estado del Infantado") in 1475; subsequently, the Dukes of the Infantado were made first-rank Grandees of Spain, and were therefore allowed to wear their hat in the presence of the king. Íñigo de Arteaga y Martín (b. 1941) is the 19th Duke of the Infantado. "Vert a bend gules fimbriated or" are the oldest known arms of Mendoza; subsequently modified several times, the arms always included a red bend on a green field. The arms quartered per saltire were introduced by the first Marquis of Santillana and appear on a seal dated 1440; the marquis quartered his father's arms (Mendoza) with his mother's arms (de la Vega). His descendants were known as Mendoza de Guadalajara or Mendoza de l'Ave María. In the representations of these arms, the first quarter is inscribed with "AVE MARÍA" while the third quarter is inscribed with "PLENA GRATIA" (or, at least "GRATIA"). The coat of arms of Guardo is "Per fess, 1. Vert a ruined castle argent masoned sable port and windows of the same, 2. Quarterly per saltire, 1. Or the writing 'AVE MARIA' in letters sable, 2. and 4. Vert a bend gules fimbriated or, 3. Or the writing 'GRATIA PLENA' in letters sable. The shield surmounted by a (Duke's ?) coronet or."